Sara thanked the cast and crew of Simmba in the post she put up. 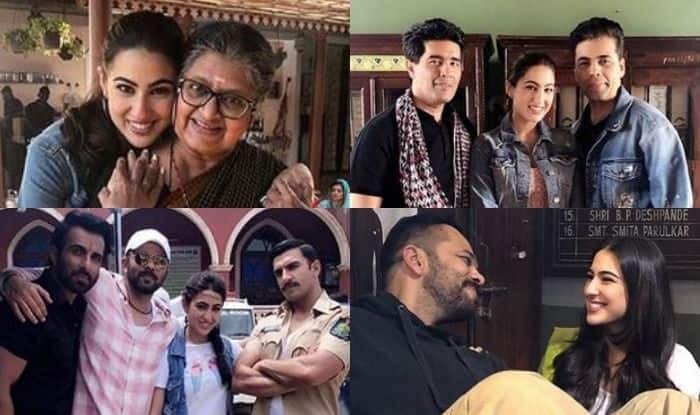 It must have been an exciting journey for the cast and crew of movie Simmba, judging from the never before seen pictures actress Sara Ali Khan put up on her Instagram page. The movie, which was directed by Rohit Shetty and written by Yunus Sajawal and Sajid-Farhad, had, along with Sara, actor Ranveer Singh playing the lead role. The post she shared contained a number of collages of her with the director, the actors and the crew, and she also penned an emotional thank you to everyone involved in the making of the action film. “@ranveersingh you truly are a super duper ultra cool star. Thank you @farhadsamji @sajid_samji for always being there for us, and for writing this spectacular script! @jomontjohn thank you for shooting us with so much love!! @karanjohar thank you for always being here for me and giving me the best advice always. Simmba, which is a spin-off of the Singham franchise, also has actor Ajay Devgn making a special appearance, reprising his role of Bajirao Singham. And a surprise entry to the movie was actor Akshay Kumar, whose role had been kept under wraps by the makers, and which was only revealed when his fans after watching the movie in theatres, shared the news on social media. This is Sara’s second movie after making her Bollywood debut with movie Kedarnath, in which she starred alongside actor Sushant Singh Rajput and which was directed by Abhishek Kapoor.